Representative Honours: Northern Ireland: 13 Full Caps / 1 Goal (1994-1998), 4 B Caps / 2 Goals (1994-1998), Under-18, Under-17; Irish league: 2 Caps (1989). Club Honours: (with Linfield) Irish League Champion 1986/87, 1988/89; Gold Cup Winner 1988/89; Irish League Cup Winner 1986/87; (with St Johnstone) Scottish League Division One Champion 1996/97; Scottish League Cup Runner-Up 1998/99. Awards: Ulster Young Player of the Year 1987; Scottish league Division One Player of the Year 1996. Having won Youth caps, George O’Boyle started his Irish League career with Distillery, where he made 25 appearances before joining Linfield. At Linfield he developed into one of the best young players in Northern Ireland, and was voted Ulster’s Young Player of the Year in 1987, the same season as he claimed an Irish League winner’s medal. A spell with Bordeaux proved short-lived and he returned to Linfield on loan in 1988. During his season back at Windsor O'Boyle received Inter-League recognition and his first inclusions in Billy Bingham's Northern Ireland squad - however it would be another five years before he was actually capped. 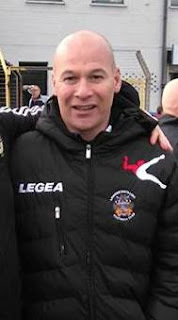 O’Boyle moved to Scotland with Dunfermline in the summer of 1989. Whilst with Dunfermline he was called up by Bryan Hamilton for a Northern Ireland ‘B’ international with England, and on 10th March 1994 he scored in a 4-2 defeat at Hillsborough in Sheffield. That goal brought another call-up to the Full international squad, and he went on that summer’s trip to the USA. He won his first cap as a substitute on 3rd June against Colombia, a 2-0 defeat, and eight days later he started against Mexico in a 3-0 defeat. The summer of 1994 also saw George O’Boyle make a tribunal-set-£200,000 move to Scottish First Division side St Johnstone as a replacement for Aberdeen bound Billy Dodds. His form over the next few seasons saw him regularly top the goalscoring charts and establish his place in the world of international football. In 1995/96, the same season that he scored 23 League goals, he was linked to a host of top Scottish sides, including Hearts, Hibs and even Rangers. His reputation was further enhanced as he came of the substitutes bench to score for Northern Ireland in a 1-1 draw with Germany in April 1996. St Johnstone resisted all attempts to lure their top striker away, and he eventually helped them to the Scottish Premier League in the late 1990s. In 1998 O’Boyle scored his last goal in a Northern Ireland shirt as the Republic of Ireland were defeated 1-0 in a ‘B’ international in Dublin on 11th February. Regular appearances from the bench during Lawrie McMenemy’s first year in charge yielded little joy and as injuries started to plague O’Boyle he made his final appearance, again from the bench, against Finland on 10th October 1998. Injury problems, including a cruciate ligament problem put him out of action for much of 1999 and 2000, but it was his off-the-field antics that drew the most attention. In January 2001 St Johnstone sacked George O’Boyle after being found guilty of gross misconduct. It followed allegations that, along with Saints team-mate Kevin Thomas, he had been seen taking cocaine in a Perth bar. On leaving St Johnstone O’Boyle started to train with Raith Rovers, signing a short-term contract in July 2001. He failed to make an impact at Raith and was released that October. Four goals in six competitive appearances during a month with Brechin City pre-empted a move to Queen of the South. His three goals in seven League games for the Doonhamers, before injury ended his season in February, helped them claim the Scottish Second Division Championship in 2002. A double of sorts was claimed as Brechin won the Third Division title.Like so many local players based in the mainland, O’Boyle returned to the Irish League during the summer of 2002, scoring on his debut for Glenavon. After a brief spell with Ards the following season, O’Boyle returned to Scotland with Junior side, Bo’ness United. Later he played with other Junior sides, Kelty Hearts and Carnoustie Panmure, where he was assistant-manager for a few years. In May 2016 he was appointed assistant head coach of Lisburn Distillery. Summary: 1(12)/1. Won 5, Drew 1, Lost 7. Summary: 4/2. Won 2, Drew 0, Lost 2.